Hi, everybody! 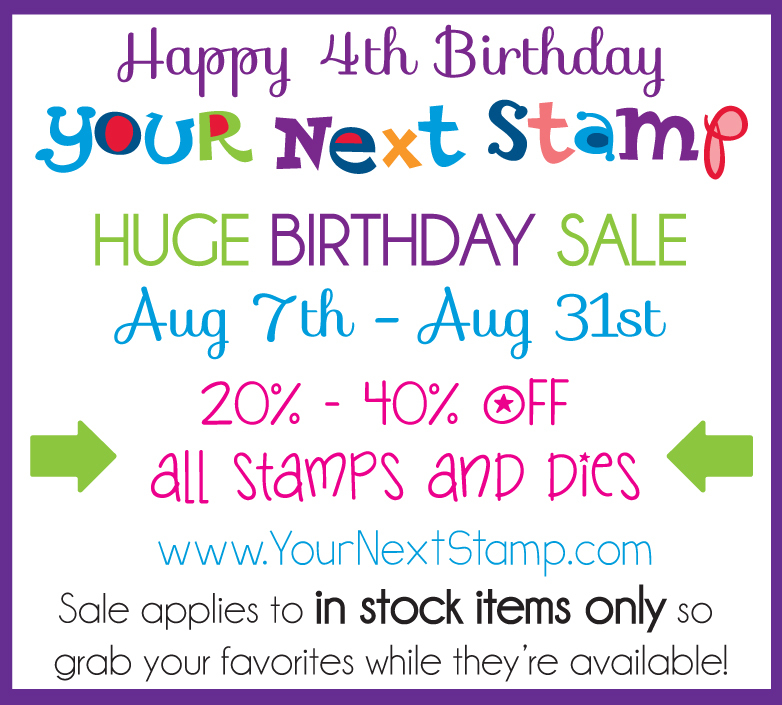 Glad you’re joining us today to celebrate Your Next Stamp’s 4th Birthday! We’re so happy to have you celebrating with us! You probably arrived from Nicole’s blog, but you can find the full list of blogs in today’s hop at the bottom of my post! As part of the celebration, we’re introducing four clear stamps, part of a fabulous new stamp line designed by Penny Johnson exclusively for YNS, “In Vogue”! Disclaimer: I drew a mouth on each lady in the image. The original artwork, when stamped, does not contain a mouth for either character. It was a personal choice and shouldn’t reflect on YNS or Penny Johnson. Our blog hop runs until Saturday, August 10th at midnight Eastern Time, so make sure you get all of your commenting done before then! The list of winners will be posted on the YNS blog on Sunday, August 11th. Wait, there’s more! Karen is having an anniversary sale in the YNS Store all month long! 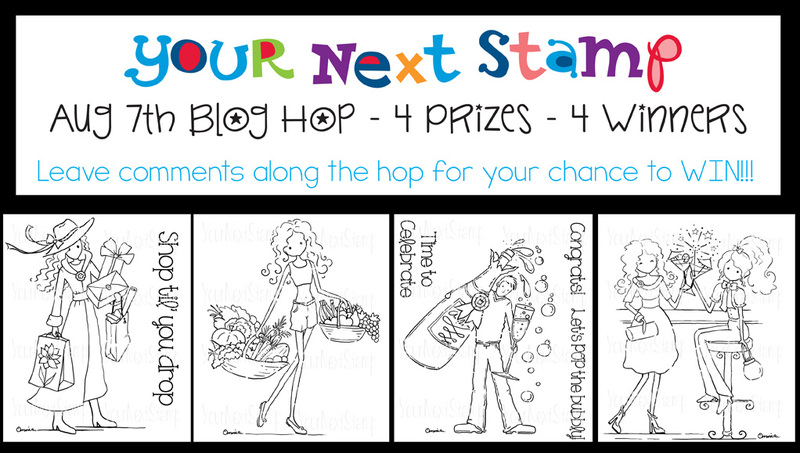 Here’s your chance to pick up some or all of the stamps on your YNS wish list! Now, it’s time to visit the YNS blog! A colorful combination for Garden Variety Tuesday! Switching It Up for Farm Fresh Friday! Darling card love the paper choices and the coloring of the images is wonderful. I love these new images and how fun to color. Wonderful work. So loving these new images!!! What a cheerful card u made! 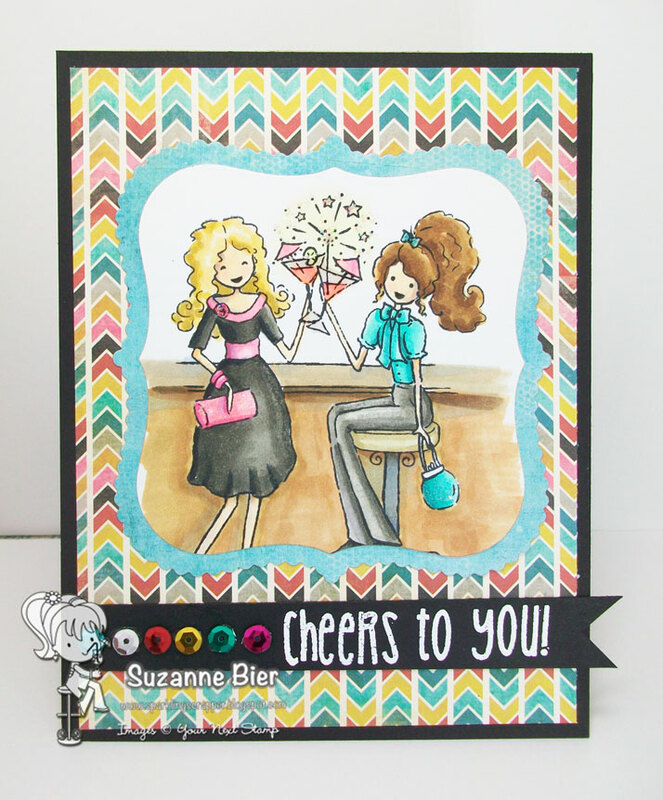 Suzzane: Delightful image and really beautifully colored card!!.. Loved the blingie!! THE girls on THE card are smasching. Such a fun image to create with. Great card. Happy Birthday YNS! Love the new stamps. Your card is GREAT! Great colors and design! Very pretty. I like all 4 new images but think this one is my fave. Fabulous card Suzanne. You girls have really outdone yourselves. Super cute sentiment to go with the image on your card. Love the colouring. Oh very cute, love the coloring! Beautiful card, looks like it's fun time! Love your paper choice. Great card. Love the colors, your coloring skills and the added smiles make the card super happy! Cute card, love the new images. And Cheers to You, too, Suzanne!! Wonderful card. What fabulous new images and love the size. Lovely card! The DP you used makes the image pop! TFS! sweet card…love the patterned paper, sequins and the great image. Such a beautiful card! This is my fav image released! you have coloured the image just wonderfully! You did such a great job with the coloring – nice card! !